It's not everyday that I get surprised. Sometimes it could be good, often times, fantastic. But definitely, it is always unexpected. Rather than having something routine, you get to experience another level or dimension if you will. At CRYSTAL DRAGON, I was more than surprised. I was astonished. Through the looking glass, CRYSTAL DRAGON'S atmosphere is very different from the outside. 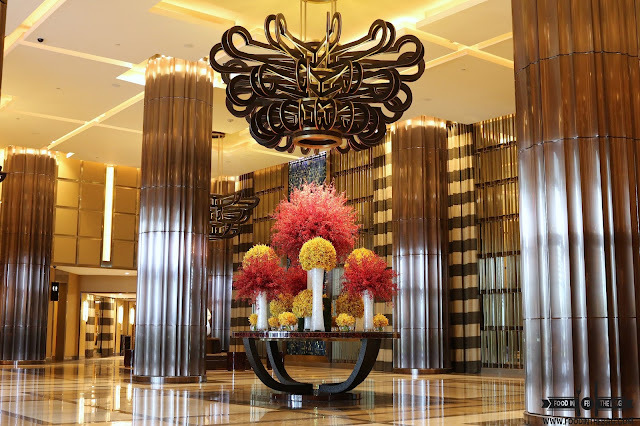 Here your visual senses are treated to a stylish and contemporary feel. 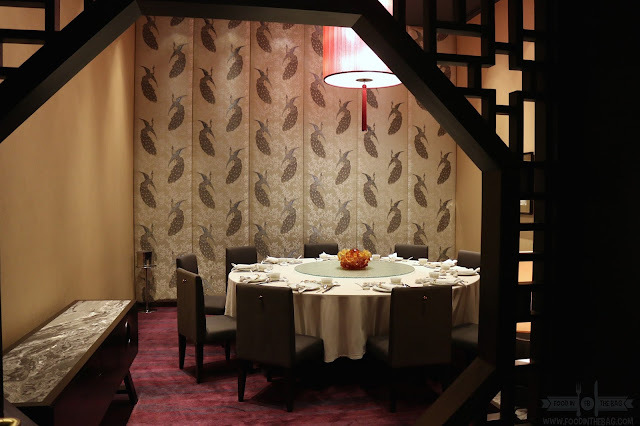 It seems you are transported to a magical place that serves delicious Cantonese and regional Chinese Specialties. To start off, different interpretations of the usual dim sum were placed on our plates. 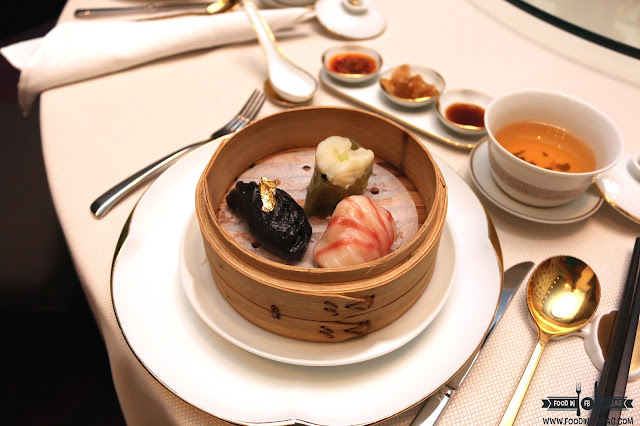 The CANTONESE STEAMED THREE DIM SUM COMBINATION had created an interplay between each other. The Scallop and Mushrooms had spinach wrap to give it a more healthier feel. The Crystal Prawn was fluffy and filled with small shrimps, making sure that there was no room for extenders. On the other hand, a bolder dumpling would be the Crab Meat and Abalone. Encased in a squid ink wrapper and topped with a gold flake, this would definitely bring good fortune. Making great use of what the sea has to offer, the kitchen produced the BRAISED SUPREME SEA TREASURE BROTH with FISH ROE. 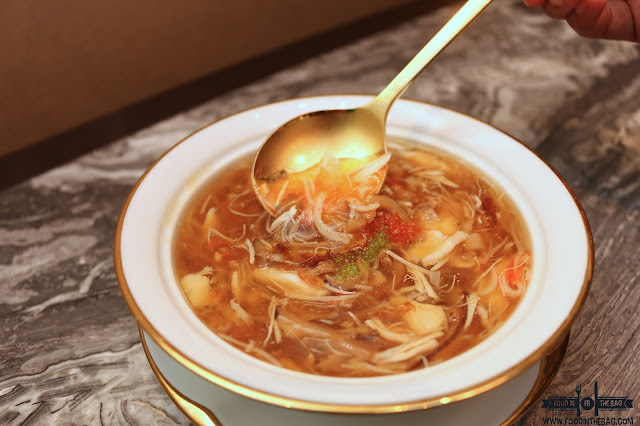 This soup was filled with texture and flavors that were not overpowering one another. The crab meat went well with the fish roe while the broth wasn't too heavy. Perfect way to relax the appetite. When the WOK FRIED TIGER PRAWN was set on the table, the sense of smell was lighting up. There was a buttery and citrus aroma that filled the room. The Prawn was cooked to perfection. It wasn't dry as one would expect. Rather, it was juicy. 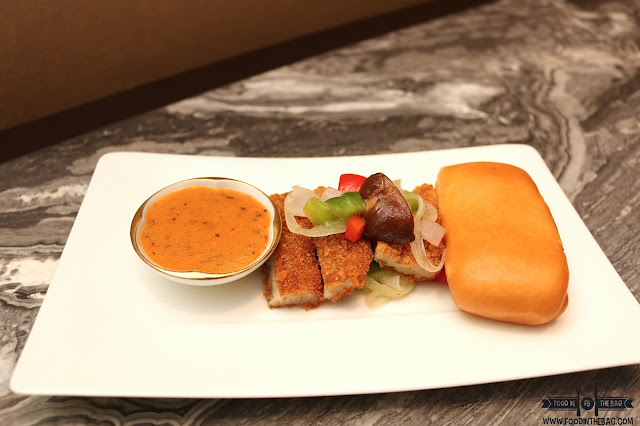 Something different would be the PORK RIBS with KUAR BOA. 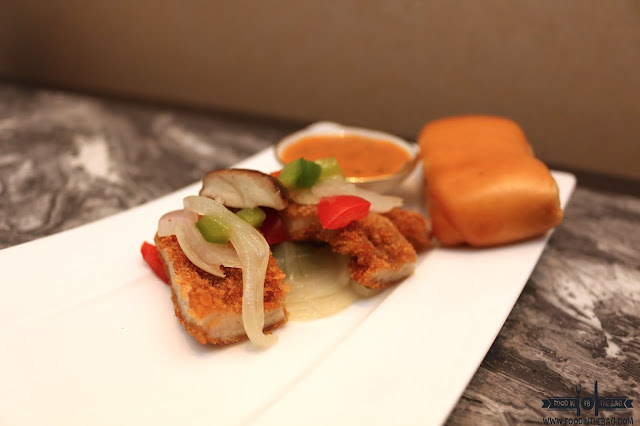 Served with Mongolian sauce and vegetables, this is a different take on fine dining cuisine. One could create their own sandwich from the pork ribs or eat it as is. The sauce gave the dish a balanced taste. 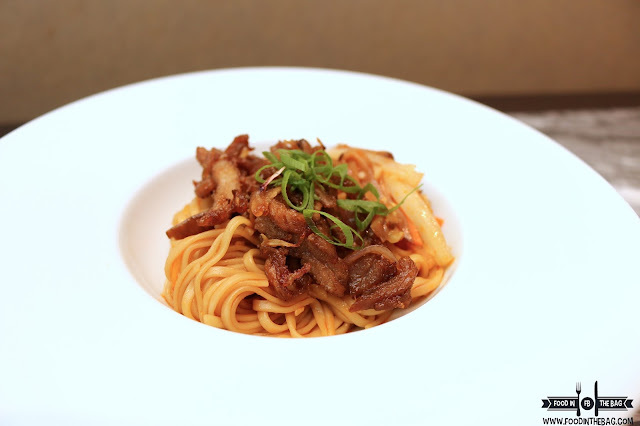 A crowd favorite, you must order the HAND PULLED NOODLES with SHREDDED US FARMED DUCK. This course creeps up to you from behind. After one or two slurps, you get a tingling sensation at the back of your tongue. It has a bit of spice in it and yet you would continuously look for it. It wasn't overwhelming and was just right for this kind of dish. Using the US FARMED DUCK made it leaner and gave it more texture to bite on. 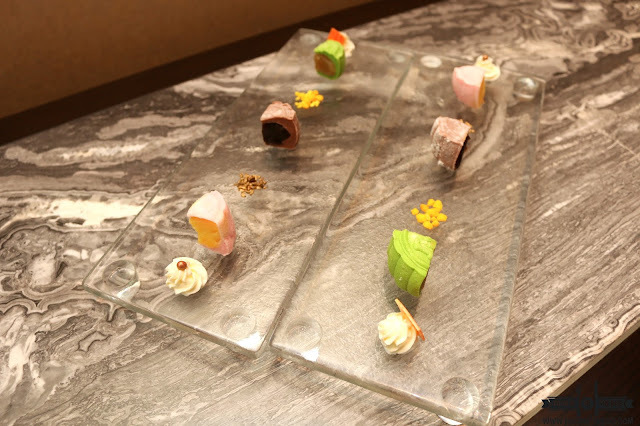 Dessert is an excellent way of displaying how Chinese Cuisine could be versatile and yet familiar to the Asian tongue. After the exquisite courses, the kitchen introduced two dessert dishes. The first one was the MANGO SPHERE COCONUT MOUSSE. At first look, you might think of it as an egg. One scoop in and you are greeted by a gelatinous, almost liquid treat. 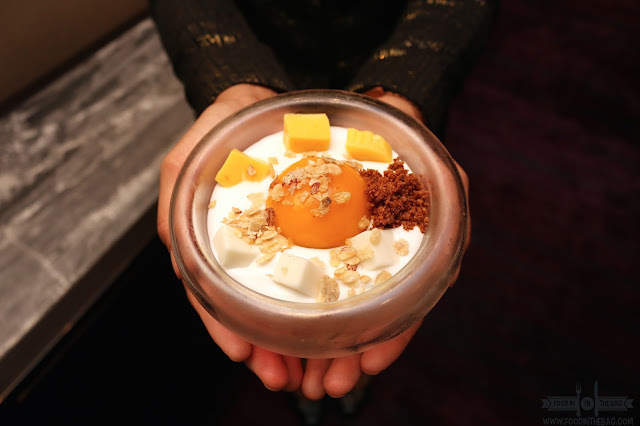 The coconut and mango greets your taste buds making sure that the flavors intertwine. The sweetness is precise. There seems to be a science in this as they created the perfect dessert. To celebrate the mid autumn festival, MOON CAKES were prepared by the Chef Bong. Not just any moon cake but SNOW SKIN MOONCAKE. These are actually healthier version compared to the traditional ones which uses more oil and sugar. Almost similar to mochi in terms of texture, three home made flavors namely: WHITE BEAN PANDAN, RED BEAN CHOCOLATE and CUSTARD STRAWBERRY were created. Out of the three, the Strawberry Custard stood out as it was tame and yet refined. The pandan was refreshing while the red bean and chocolate played well with one another. Speaking of, CHEF BONG JUN CHOI is a natural. 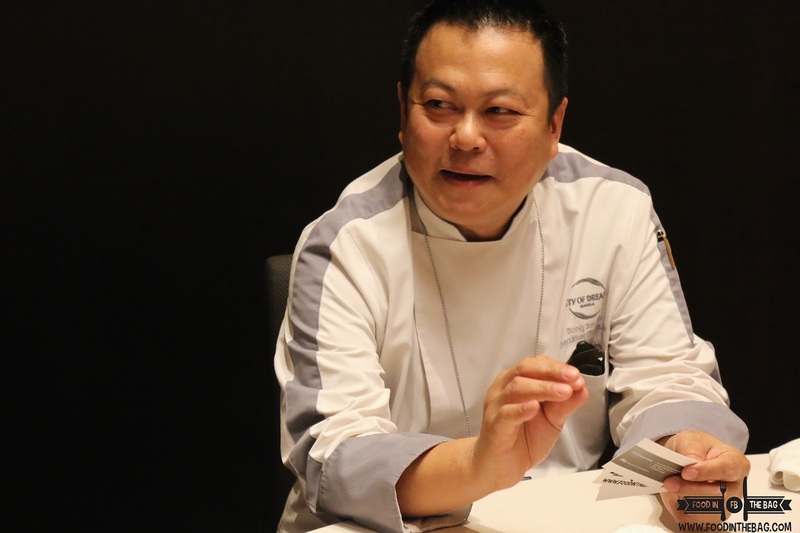 Being born in Malaysia, his Chinese Roots brought him back to China and into its culinary world. 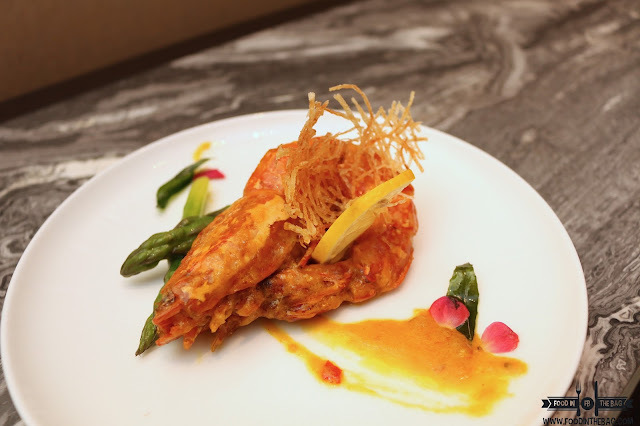 Being able to study, practice, teach, and even judge proper cuisine is why CRYSTAL DRAGON got him as their executive chef. Having a culinary experience of 39 years would definitely made this man a master in Chinese Cuisine. 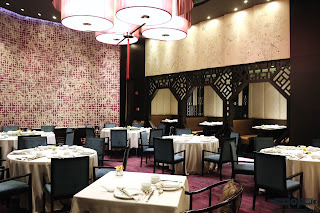 Believe it or not, most of the chefs in other Chinese Restaurants in the Metro look up to Chef Bong as he is their mentor and friend. CRYSTAL DRAGON is an exquisite example of a surprise waiting to be unleashed. Initially intended just for high rollers, this Chinese Restaurant is an exclusive treat to all the guests of CITY OF DREAMS. You could check out and make a reservation to CRYSTAL DRAGON here. Disclaimer: Wrote this based on my experience. Was invited to try out the new dishes from Crystal Dragon.